M. Tegeler, A. Monas, O. Shchyglo, I. Steinbach, F. Varnik. View from the top of the simulation domain depicting stream lines of a flow through a channel along dendrites. 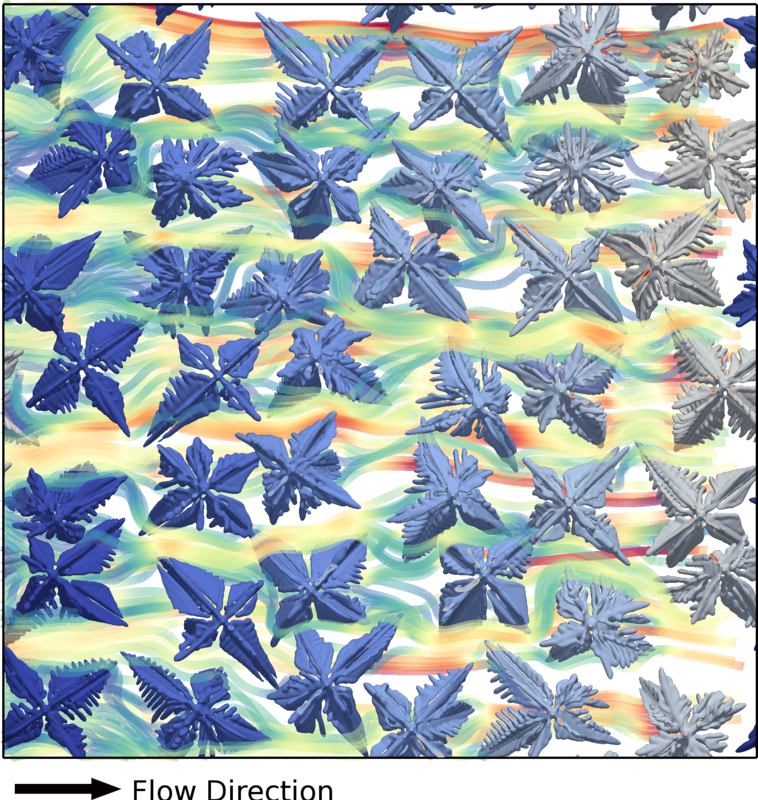 In this work, we present a combined phase-field lattice-Boltzmann study of the time evolution of permeability in a Mg-5%Al-cast alloy during its solidification. The phase-field method (PF) is used to determine dendritic microstructures close to the columnar to equiaxed transition under purely diffusive conditions. The fluid flow through the thus obtained microstructures is investigated using the lattice-Boltzmann method (LBM). First, the applicability of the Darcy law is demonstrated by showing that the effective volumetric flow rate across the microstructure is linearly proportional to the applied driving force. This allows us to introduce the concept of permeability in the context of microstructure evolution. In a second step, permeability is determined at different stages of solidification. Our results quantify the decrease of permeability during solidification. These studies underline the maturity of the hybrid PF–LBM approach in dealing with complex phenomena.